We’re immensely proud to have been the first organization in the world to offer an urban venue to experience the thrill of indoor axe throwing in leagues, walk-ins, group parties and team building. 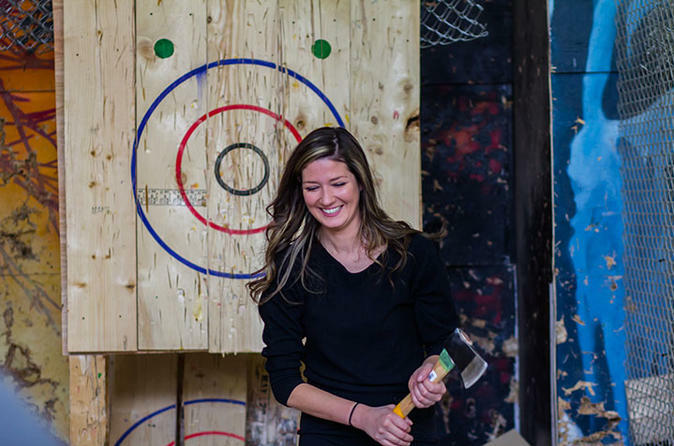 Visit us to enjoy the thrill of axe throwing during our walk-in hours each weekend taking place from 6 - 9pm Friday, 12 - 3pm Saturday and 2 - 5pm Sunday. Our coaches will be on hand to instruct those who have never thrown an axe before, and offer tips on technique for more experienced throwers. BATL Novi offers a fully licensed bar and kitchen serving local beers, coolers and snacks. Activity time lasts approximately one hour, and includes one-on-one instruction on how to safely throw an axe from our expert instructors. Our coaches will be on hand to teach those who have never thrown an axe before, and offer tips on technique for more experienced throwers. Similar to public skating, skiing or swimming – throwing takes place on shared lanes in a public setting, and guests may need to make allowance for other participants based on guidance from your BATL coach. Participation amount may vary based on total attendance. Spectators of all ages are welcome and only charged a fee if they decide to throw an axe. Guests aged 16-17 require a parent or legal guardian present to consent to their participation in axe throwing.